Hello! 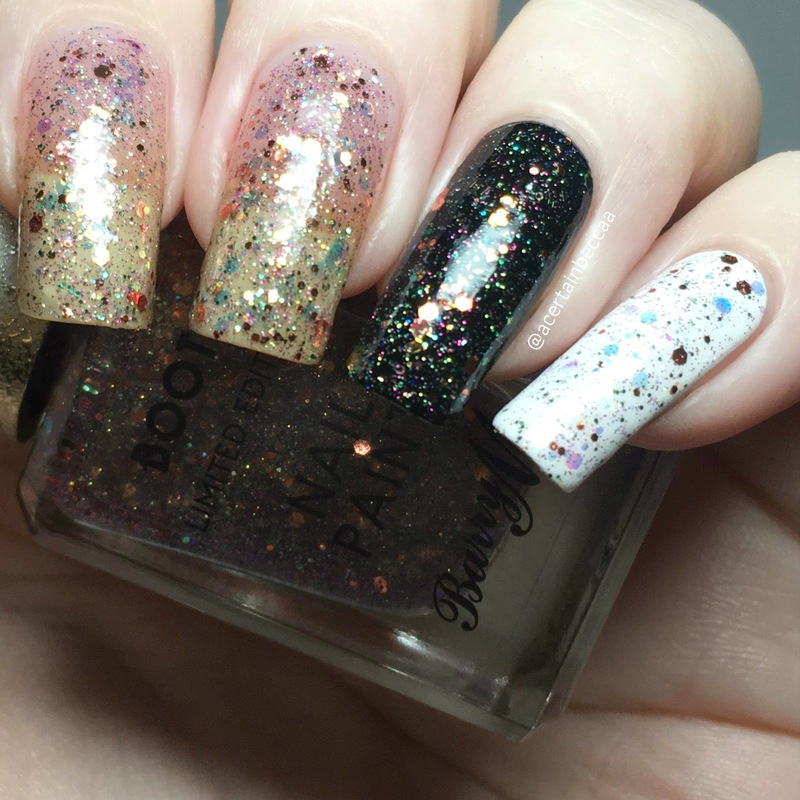 Today I'm back with two new Boots exclusive Barry M nail paints. I feel like I've been sharing a lot of Barry M recently, they're on a roll releasing new polishes! 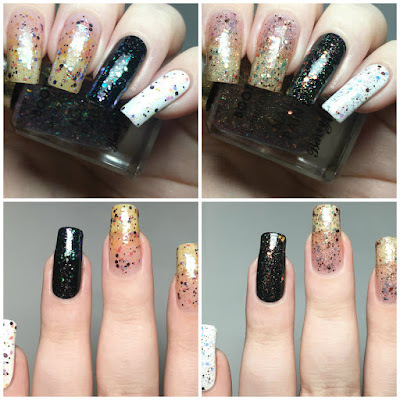 If you missed them, take a look at my swatches of the newest Molten Metals here, Under the Sea nail paints here, and Autumn/Winter gellies here. Read on for my swatches of 'Afterparty' and 'Fairy Lights'. Both polishes consist of glitters in a clear base. They are densely packed, but not enough to achieve full coverage easily. I would wear them as toppers myself, although that is down to personal opinion. 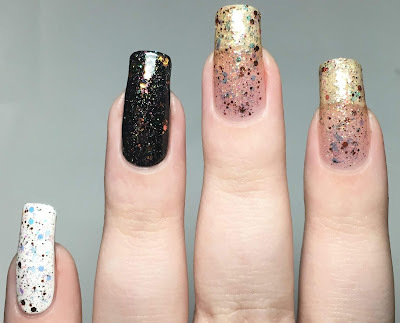 I've swatched both polishes on their own, over black (Barry M 'Black Forest'), and over white (Barry M 'Cotton') to show the different looks you can achieve. 'Afterparty' consists of an iridescent glitter mix (mainly blue/purple) ranging from tiny microglitters to hexes. The formula is slightly thick, but is smooth and easy to apply, and you don't have to fish for the glitters. I found it easier to pick out purple, pink, green and blue over black, and lighter blues, pinks, and oranges over white. Below shows two coats alone, one coat over black, and one coat over white - all with topcoat. 'Fairy Lights' consists of a similar mix, but this time mainly copper/bronze. Again, the formula is slightly thick but smooth and easy to apply, and no fishing is needed. Over black I could see more of the copper tones and darker colours, and over white this has a nice pop of blue with the copper. Below shows two coats alone, one coat over black, and one coat over white - all with topcoat. What do you think? Which do you prefer, the polishes on their own or as toppers? As mentioned earlier, I think I'm more inclined to use them as toppers. Plus this way you get different effects depending on the base colour you choose! There are also two Superdrug LE's, I'll be back with those soon. You can find both 'Afterparty' and 'Fairy Lights' on the Boots website for £3.99 each here (they are also currently on 3 for 2).